He has known his abc's for some time now. I didn't realize he only recognized them as upper case and hadn't learned lower case. It was as if Little Learning Lovies read my mind! 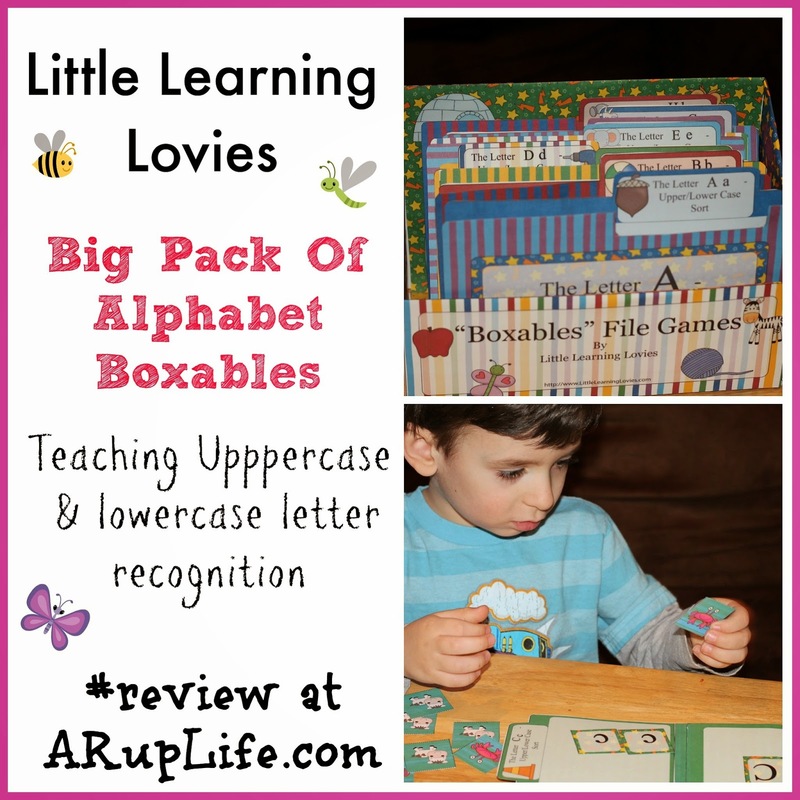 I had just started looking for something to help teach this when they came out with their latest product - Big Pack of Alphabet Boxables! Boxables are printable game that forms a folder and can be self contained. Little Learning Lovies has lots of them! Big Pack of Alphabet Boxables is a set of 26 (one for each letter) file games that fit in a box (printable box included). First thing I did was print out the pieces for the box and build it. I have to say it is ADORABLE! I love that itwas included with the set. The box took about 15 minutes to build and it was about 30 minutes for me to build the games. Next is the fun part! I let my little guy pick the letters he was interested in. We talked about how the letters came in two sizes and then I showed him the Uppercase and Lowercase sides of the board. Then I had him sort them. What is really neat is the cards are two sided so you could use this game a few different ways. The second side has pictures that start with the letter. So adding a phonic part to the game would be neat too! I plan on using the letters later on as a giant game by taking two lower and two upper and mixing them up then having Jace sort them as well - once he is familiar with each letter. I think this set is adorable! I love that it fit the need we had in our homeschool and was something I could easily put together and use. All I needed was ink, cardstock (which we always have on hand), scissors and glue. Jace had a fun time working on his letters. He happily played with two letters during his school time. The bright colors and cute graphics drew him in. In fact I had a hard time keeping him away while I was building the box and games. If you have a preschooler you will want to sign up for Little Learning Lovies' 30 Days of Preschool Fun! Sandra has created activities for each letter of the alphabet! It is a great way to sample what LLL has to offer!